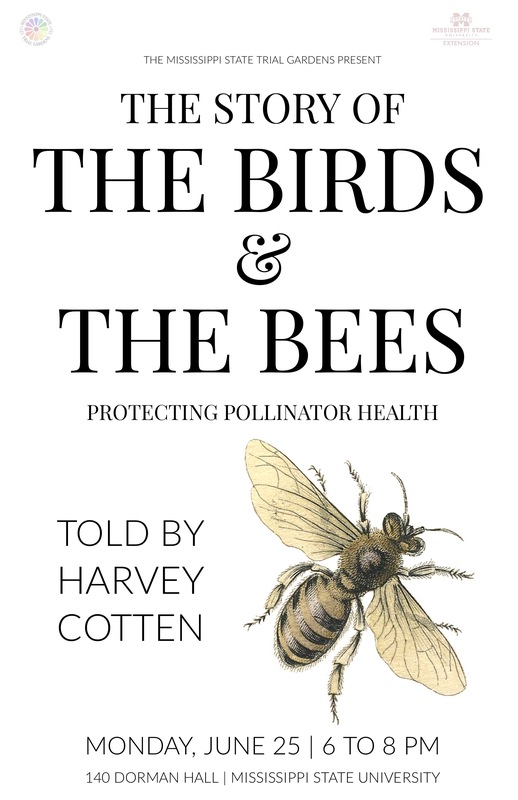 Come hear the Story of the Birds & the Bees: Protecting Pollinator Health. Monday, June 25, 6:00 pm. 140 Dorman Hall, Mississippi State University. Refreshments offered. Storytelling starts at 6:30pm. Storyteller Harvey Cotten has lived and gardened in the South for his entire life. After completing his horticulture degree from Mississippi State University, he worked in both the landscaping and nursery business. He is the former Chief Operating Officer for the HSVBG of sixteen years. Now retired from the Huntsville Botanical Garden, Harvey is available as a consultant and expert advisor for garden projects and landscapes. The author of Easy Gardens for the South, Harvey has tested all of the plants in this book at the Huntsville Botanical Garden, where he has extensive experience with all the latest cultivars. Copies of the book will be available for sale and signing. He serves as Director Emeritus of the Alabama Nurserymen s Association, and is on the board of the Horticulture Research Institute and the Alabama Invasive Plant Council. Harvey writes a weekly column for the Huntsville Times, and is a weekly guest on the Noonday News television show on the local ABC affiliate. Will copies of Easy Gardens for the South be available?